On Sunday (March 20th), before I stopped over at the AIPAC policy conference, I decided to check out the anti-Israel rally that was gathered in front of the White House and later marched to the DC Convention Center where AIPAC was holding their conference. I spent approximately an hour at the rally, and I have to be honest with you, there was nothing special about it. Before the scheduled date of the rally, they were claiming thousands were going to attend the rally; and to be fair, over 1,000 people did rsvp to their Facebook event page. However, when I got there, it appeared that they fell far short of that number. Facebook post claiming thousands would be in attendance. The protestors did grow in number as the day went on, but it was far from the “thousands” they were boasting about. All of the cliché protest actions were done. 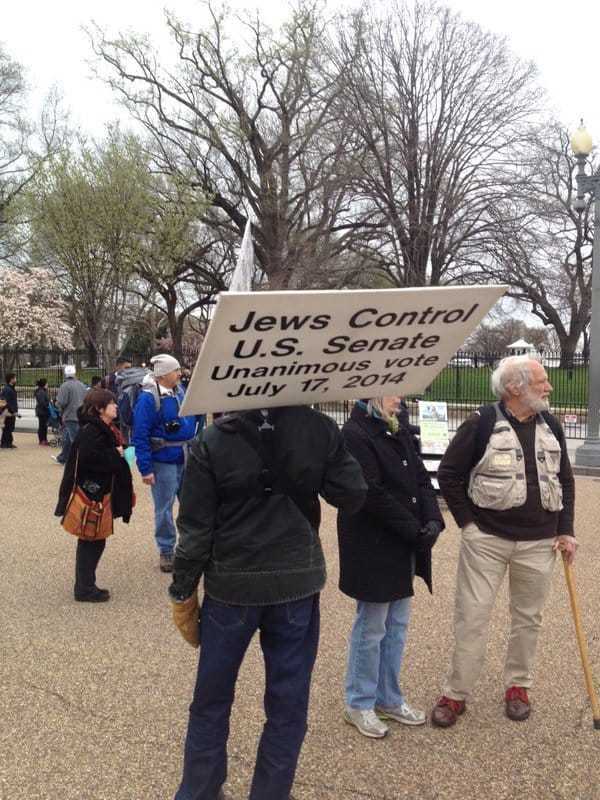 Nearly all attendees wore Keffiyah’s, the chants of “From the River to the Sea” and “Free, Free Palestine” were repeated ad nauseum, and signs ranging from “End Israeli Apartheid” to the blatantly anti-Semitic “Jews Control U.S. Senate” were waved around. The fringe orthodox group, Neturei Karta was at the rally. Appropriately, people seemed to be treating them like the circus sideshow attraction they are; running up to take pictures with them, like they were nothing more than a new wax exhibit at Maadam Tussauds. When the Puerto Rican born Hezbollah fanboy, Abbas Hamideh took to the microphone, that’s when things got a little more fun. Aside from repeating the chant of “From the River to the Sea” he gives a quick shout-out to yours truly (I feel so special) by referencing my article from the other week where I accurately highlight his sympathies for Hezbollah. What exactly is a “real Jew” to him? Does he think that if I were to oppose Israel, I’m a Jew; however, if I support Israel I’m just a Zionist? Does he think my ethno-religious background is determined by my political views? Unfortunately for him, it doesn’t work like that. Being a Zionist does not make me less of a Jew. In fact, I believe it only brings me closer to my people. The event resulted in a few violent skirmishes at the convention center when some Guy Fawkes mask wearing, Hezbollah sympathizers assaulted convention attendees and then tried to rush into one of the entryways. Despite the fact that Jews attended the rally, the Jew-hatred was palpable. Alex VanNess is a fellow at the Endowment for Middle East Truth and formerly served as the director of the Middle East Peace and Security Policy at the Center for Security Policy. In the past, Mr. VanNess worked as an Intern for Congressman Doug Lamborn and then later as a member of staff for Congressman Tom McClintock of California. His articles have appeared in The American Thinker, Breitbart News, The Washington Examiner, and The Daily Caller, where he writes extensively on U.S. defense spending, the U.S./Israel strategic relationship, and the existential threats posed by Islamic fundamentalism. Alex holds a degree in Political Science and Peace & Conflict Studies from Wayne State University, and has studied Jewish Law and Philosophy at Shor Yoshuv Rabbinical College in New York.